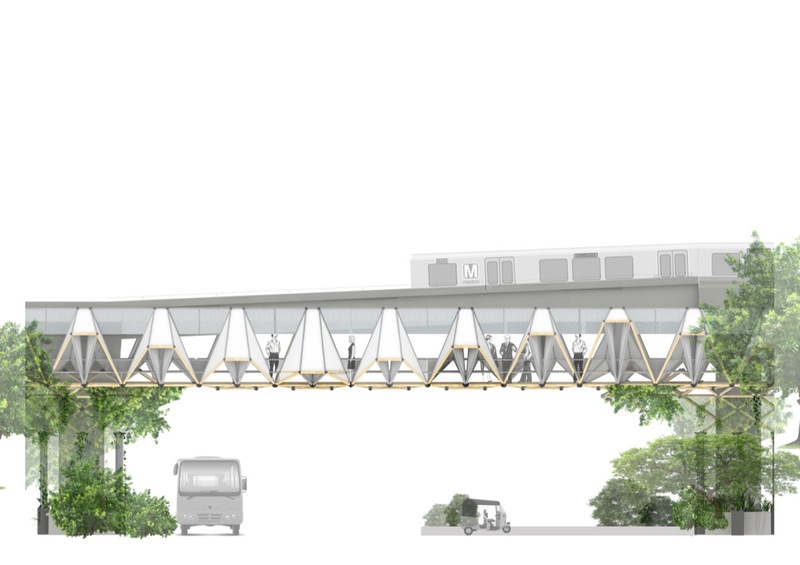 The Pedestrian Skywalk at Delhi, by Chaukor Studio - ArchitectureLive! The development of various public transport modes in the metropolitan city of Delhi like railway line, Delhi metro, bus stops and auto-rickshaw stands has increased the number of pedestrians on the roads. Due to no proper walking space for the pedestrians on most of the major road junctions in the city, the intersection of the vehicular traffic with the pedestrians causes a call for alarm towards the safety of the people. Is there an eco-friendly approach to address this problem without further compromising the safety of pedestrians and also help in revitalizing the city? There is a critical need to segregate the pedestrian movement from the vehicular in order to reduce the amount of chaos in some areas of Delhi. In the present times, Delhi metro serves as the bloodline of the city and has become a boon for all the people who commute daily. It has made commuting affordable, comfortable and safe. Though the Delhi Metro has consumed land with high real estate value, green spaces and public plazas, yet the space along the metro track remains underutilized. The concept is to revitalize the space along the metro lines and utilize it to generate green eco-friendly skywalk which could separate the pedestrians from the vehicular movement in heavy traffic regions and will also add to an overall experience to the people of Delhi. This will not only revitalize the populated centers but also create an identity for the new smart city. Segregation between pedestrian and vehicular traffic is achieved through the integration of a foot-over-bridge to the existing metro track. The vehicular roads, pavements, street lights and other public infrastructure are already working in conjunction with the metro track; thus minor modifications are required to construct any structure along the existing line. The overall structure is a space frame and provides large spans without using heavy structural members. This makes the overall structure lightweight and contemporary. The frame is designed on the concept of fractal geometry in which a given module is replicated at various scales to reach the overall form. This provides with high visual complexity while enabling ease of construction. In this case; the fractal module used is a tetrahedron. The structure of the skywalk is based on the simple geometry of a tetrahedron/ space frame. The symmetric triangular geometry makes the structural design efficient as the loads are uniformly transferred. This, in turn, lowers the material input, conserves energy and reduces the overall cost of construction. The basic structural module is composed of bamboo fixed with custom made metal junctions. As 75-80 percent of the structure is made from bamboo (renewable resource/ rapidly growing grass); this drastically reduces the embodied energy of the materials and the overall impact on the environment. Electricity required for lighting is derived from the solar cells placed along the deck. This reduces the requirement of electricity and the operational maintenance cost. The bamboo structure encapsulates the Metro piers such that the vertical greens can extend from the piers onto the space frame and the bottom side of the FOB deck. Thus, the reduced green cover on the street is revived thus reducing the exposure of the harsh sun on the pedestrian pathway. Various strategies are incorporated to ensure comfort and quality experience to pedestrians. This encourages the people to use FOB rather than crossing intersections. The skywalk allows an uninterrupted view of the contextual surroundings, green spaces and the heritage buildings. Seats provided at regular intervals allow pedestrians to take short halts to rest or communicate without disturbing the passage of others. Roofing above the deck protects the patrons from harsh weather conditions while openings from the sides ensure appropriate cross ventilation. Integration of kiosks increase commercial potential of the skywalk and also acts as a useful facility for the pedestrians. The space frame is designed on the concept of fractal geometry in which a given module is replicated at various scales to reach the overall form. This provides with high visual complexity while enabling ease of construction. In this case; the fractal module used is a tetrahedron. The design is modular in nature and can be replicated using the same structural module at various places. This opens up numerous possibilities of placing other FOBs and skywalks around the city along with the existing metro lines, flyover as per the site requirements and conditions. With modularity comes flexibility and affordability, large scale off-site production is possible in modular designs and can be efficiently transported and assembled on site in very less time. This reduces the construction time exponentially without hampering the existing circulation routes on site. Steel columns are provided around the metro columns. These pre-fabricated steel columns act as the main structural support for the FOB. The similar support system is planned in the medians of the road at required junctions for extra support. A modular bamboo space frame is fixed onto these steel columns. These support members transfer the load of the FOB evenly and efficiently onto the steel columns. A modular system consisting of the base , side frame, and roofing structure is then conjoined together and anchored onto the bamboo frame structure. The designed structure provides a potential canvas for growing vertical greens on the FOB, further integrating it with the landscape around the area. This shall further provide relief and shade to the passersby at the road level. 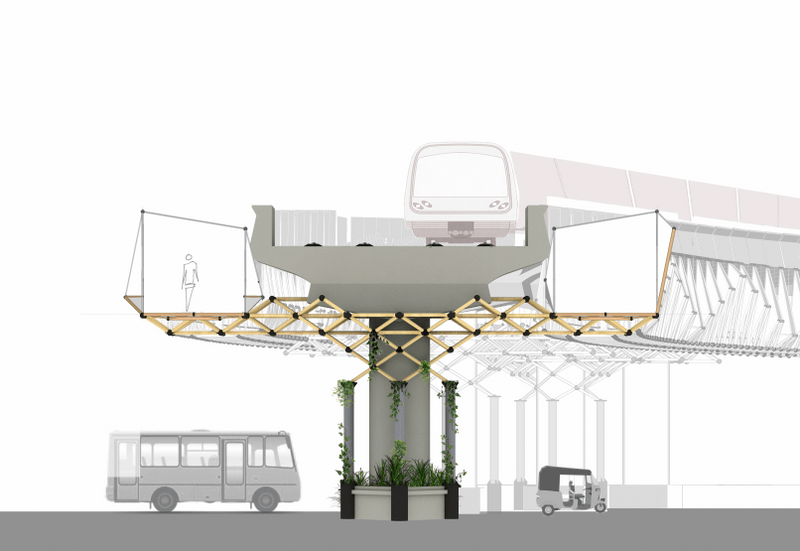 This modular design of a pedestrian skywalk is a small step taken towards improvising our cities for a better future through eco-friendly planning. A number of these skywalks can be planned on the major road junctions in Delhi as well as other cities to eventually stop the haphazardness of crossing a busy street. 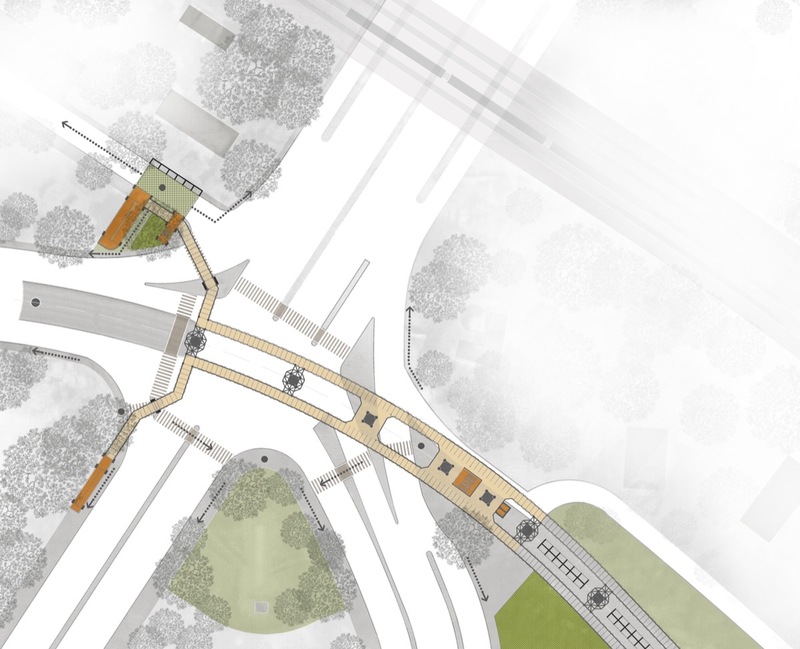 The flexibility in design allows the structure to be a part of an existing urban element which is a step taken to make our city more organized. This is a simple idea that can sustainably integrate with the existing and thus revitalize our surrounding environment for a better future.